Using computational modeling, researchers at Carnegie Mellon University, the Colorado School of Mines and the University of California, Davis have come up with a design for a better liposome. Their findings, while theoretical, could provide the basis for efficiently constructing new vehicles for nanodrug delivery. Liposomes are small containers with shells made of lipids, the same material that makes up the cell membrane. In recent years, liposomes have been used for targeted drug delivery. In this process, the membrane of a drug-containing liposome is engineered to contain proteins that will recognize and interact with complementary proteins on the membrane of a diseased or dysfunctional cell. After the drug-containing liposomes are administered, they travel through the body, ideally connecting with targeted cells where they release the drug. This packaging technique is often used with highly toxic nanodrugs, like chemotherapy drugs, in an attempt to prevent the free drug from damaging non-cancerous cells. However, studies of this model of delivery have shown that in many cases less than 10 percent of the drugs transported by liposomes end up in tumor cells. Often, the liposome breaks open before it reaches a tumor cell and the drug is absorbed into the body's organs, including the liver and spleen, resulting in toxic side effects. "Even with current forms of targeted drug delivery, treatments like chemotherapy are still very brutal. We wanted to see how we could make targeted drug delivery better," said Markus Deserno, professor of physics at Carnegie Mellon and a member of the university's Center for Membrane Biology and Biophysics. In a paper published in ACS Nano, Deserno and colleagues propose that targeted drug delivery can be improved by making more stable liposomes. Using three different types of computer modeling, they have shown that liposomes can be made sturdier by incorporating a nanoparticle core made of a material like gold or iron and connecting that core to the liposome's membrane using polymer tethers. The core and tethers act as a hub-and-spoke-like scaffold and shock-absorber system that help the liposome to weather the stresses and strains it encounters as it travels through the body to its target. Francesca Stanzione and Amadeu K. Sum of the Colorado School of Mines conducted a fine-grained simulation that looked at how the polymer tethers anchor the liposome's membrane at an atomistic level. Roland Faller of UC Davis did a meso-scale simulation that looked how a number of tethers held on to a small patch of membrane. Each of these simulations allowed researchers to look at smaller components of the liposome, nanoparticle core and tethers, but not the entire structure. To see the entire structure, Carnegie Mellon's Deserno and Mingyang Hu developed a coarse-grained model that represents groupings of components rather than individual atoms. For example, one lipid in the cell membrane might have 100 atoms. In a fine-grain simulation, each atom would be represented. In Deserno's coarse grain simulation, those atoms might be represented by only three pieces instead of 100. "Its unfeasible to look at the complete construct at an atomistic level. There are too many atoms to consider, and the timescale is too long. Even with the most advanced supercomputer, we wouldn't have the power to run an atom-level simulation," Deserno said. "But the physics that matters isn't locally specific. It's more like soft matter physics, which can be described at a much coarser resolution." Deserno's simulation allowed the researchers to see how the entire reinforced liposome construct responded to stress and strain. They proposed that if a liposome was given the right-sized hub and tethers, its membrane would be much more resilient, bending to absorb impact and pressure. Additionally, they were able to simulate how to best assemble the liposome, hub and tether system. 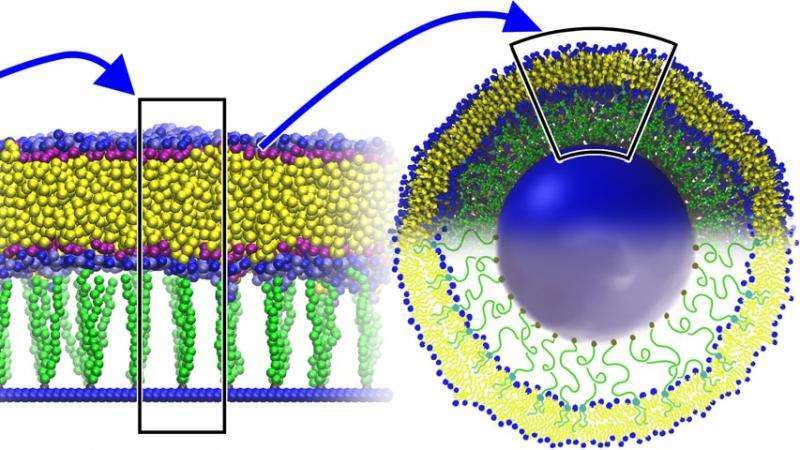 They found that if the hub and tether are attached and placed in a solution of lipids, and solvent conditions are suitably chosen, a correctly sized liposome would self-assemble around the hub and tethers. The researchers hope that chemists and drug developers will one day be able to use their simulations to determine what size core and polymer tethers they would need to effectively secure a liposome designed to deliver a specific drug or other nanoparticle. Using such simulations could narrow down the design parameters, speed up the development process and reduce costs.